When raising godly kids, use the Word of God and don’t try to teach children without it, which will only lead them to rebelliousness. God knows children and He knows what you need to do to bring them up right. 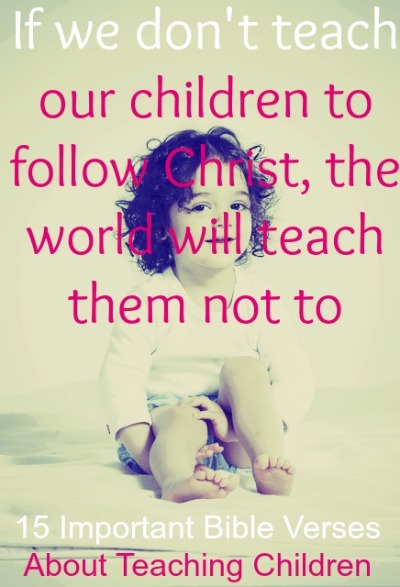 Parents are either going to prepare their children to follow Christ or to follow the world. A child will trust his parents and believe the awesome stories in the Bible. Have fun while reading Scripture to them. Make it exciting. They will be fascinated by Jesus Christ. Love your kids and be careful to follow God’s instructions, which includes teaching them His Word, disciplining them out of love, not provoking them, praying with them, and being a good example. 1. Proverbs 22:6 Train up a child in the way he should go; even when he is old he will not depart from it. 2. Deuteronomy 6:5-9 Love the Lord your God with all your heart, with all your soul, and with all your strength. Take to heart these words that I give you today. Repeat them to your children. Talk about them when you’re at home or away, when you lie down or get up. Write them down, and tie them around your wrist, and wear them as headbands as a reminder. Write them on the doorframes of your houses and on your gates. 4. Matthew 19:13-15 One day some parents brought their children to Jesus so he could lay his hands on them and pray for them. But the disciples scolded the parents for bothering him. But Jesus said, “Let the children come to me. Don’t stop them! For the Kingdom of Heaven belongs to those who are like these children.” And he placed his hands on their heads and blessed them before he left. 5. 1 Timothy 4:10-11 This is why we work hard and continue to struggle, for our hope is in the living God, who is the Savior of all people and particularly of all believers. Teach these things and insist that everyone learn them. 6. Deuteronomy 11:19 Teach them to your children. Talk about them when you are at home and when you are on the road, when you are going to bed and when you are getting up. Discipline is a form of teaching your child. 7. Proverbs 23:13-14 Do not hesitate to discipline a child. If you spank him, he will not die. Spank him yourself, and you will save his soul from hell. 8. Proverbs 22:15 A child’s heart has a tendency to do wrong, but the rod of discipline removes it far away from him. 9. Proverbs 29:15 The rod and rebuke bestow wisdom, but an undisciplined child brings shame to his mother. 10. Proverbs 29:17 Discipline your child, and he will give you rest; he will bring you happiness. 11. Colossians 3:21 Fathers, provoke not your children to anger, lest they be discouraged. 12. Ephesians 6:4 Parents, do not anger your children, but rear them in the discipline and in the teaching of Our Lord. You teach them by the way you conduct yourself. Be a good role model and don’t cause them to stumble. 13. 1 Corinthians 8:9 But you must see to it that this right of yours does not become a stumbling block for those who are weak. 14. Matthew 5:15-16 People don’t light a lamp and put it under a basket but on a lamp stand, and it gives light to everyone in the house. In the same way let your light shine in front of people. Then they will see the good that you do and praise your Father in heaven. Psalm 78:2-4 for I will speak to you in a parable. I will teach you hidden lessons from our past— stories we have heard and known, stories our ancestors handed down to us. We will not hide these truths from our children; we will tell the next generation about the glorious deeds of the Lord,about his power and his mighty wonders.